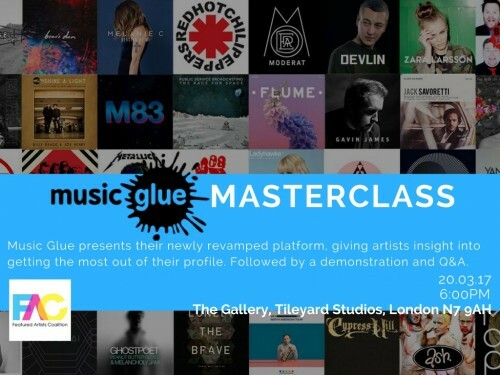 We're proud to present our very first ever Masterclass, bringing you together with the music business's specialist e-commerce platform Music Glue. Artists, managers, labels, merchandisers and promoters use Music Glue to control their online presence and e-commerce with ease, owning their data and selling anything, to anyone, anywhere, via any device, in over 25 languages and currencies. The platform makes it easy for fans to buy music, merchandise, tickets and experiences directly from the artists they love, in one simple transaction. Join us for a chance to learn about the history of Music Glue and how it has been developed over the past 10 years, to meet the needs of a rapidly changing music business. Followed by a platform demonstration and Q&A - and some drinks on the house, of course. This event is most beneficial to artists and managers who are already using Music Glue, however all are welcome.